Having a hard time organizing soccer matches with your friends? 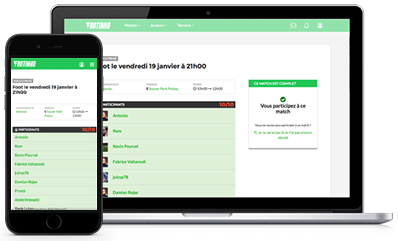 Footinho makes it easy to manage RSVP, invite players and communicate with your soccer buddies. SMS texts are a mess to manage with answered and unanswered invites to check, recheck and reinvite, hoping that nobody cancel during the week. Your matches are often canceled, or at the best one player is missing in last minute! The match organizer get depressed. He's fed up with doing everything alone, and nobody seems to care. The simplest solution to organize or join soccer matches with friends.